Google campus. Picture taking encouraged. I used to ride on Charleston Road, about a million years ago, where pheasant and burrowing owls roamed the undeveloped marshland. Now it’s Google land. I checked it out today and my otherwise mundane ride turned into something whimsical. When I lived in Mountain View and commuted to work on Shoreline Boulevard, I had to ride over Hwy 101 on a narrow two-lane road. That’s one nightmare I’m happy to put behind me. 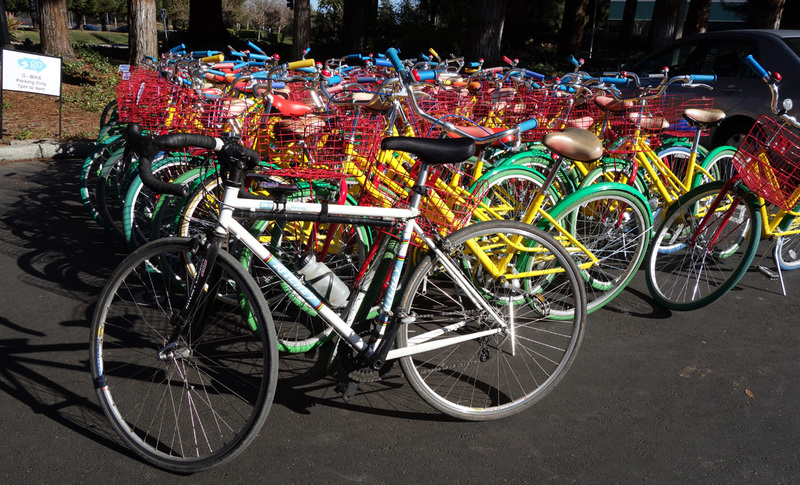 Google encourages bike riding around campus. Way to go. 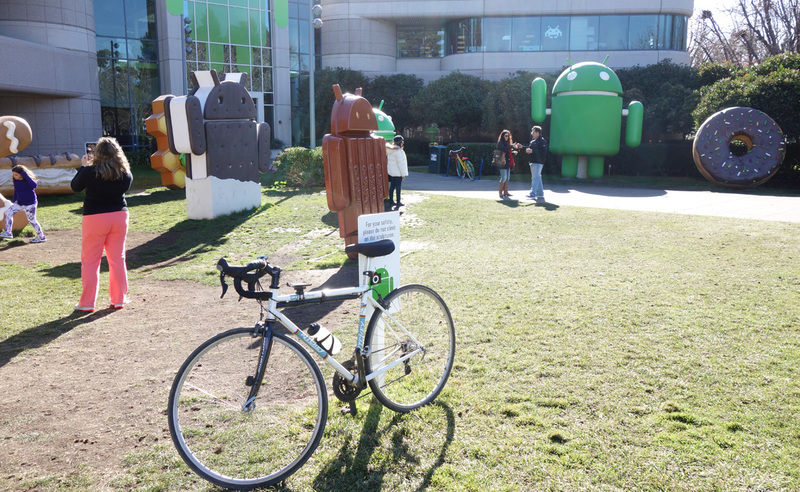 Google bikes. I don’t know why, but Mountain View has long been a vortex for innovation, and not just technology. Runner’s World magazine occupied the present-day Togo’s sandwich shop (Togo’s launched in San Jose in 1967) and Gold’s Gym at the intersection of Shoreline and 101. I couldn’t have arrived at a more opportune time in 1977. Frank Shorter triggered the marathon boom when he won at Munich in 1976, but that was just the icing on the cake. It gave the baby boomers something to aim for — running a marathon — as they embraced health and fitness. Runner’s World publisher Bob Anderson moved his fledgling long-distance running newsletter from Kansas to Mountain View in the early 1970s. In large part it was because the long-running magazine Track and Field News is based in Mountain View. When I arrived in 1977 the running boom shifted into high gear. The magazine grew to become a household name. After the 1984 Olympics the bloom was off the boom. A few years later Anderson sold the magazine and it found a new home in Pennsylvania, where it still thrives. Meanwhile, Google occupies the exalted role as Oracle for the World Wide Web, the best search engine for humankind’s vast treasure of knowledge and daily life. In the scheme of things, Google is the most relevant company in our lives. Right here in Mountain View. 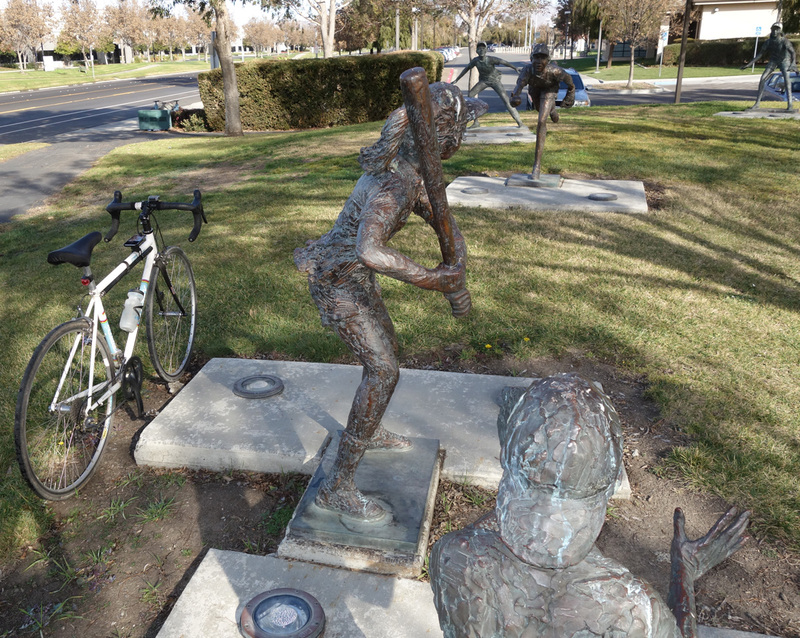 Newark community center, Maybury Road, has an absolutely brilliant bronze baseball diorama. Made my day. This entry was posted on January 12, 2014 at 4:07 pm and is filed under Ride reports. You can follow any responses to this entry through the RSS 2.0 feed. You can leave a response, or trackback from your own site.